How the brain got language: the mirror system hypothesis Arbib Michael A.
Auteur : Arbib Michael A. This book explains how the human brain evolved to make language possible and how cultural evolution took over from biological evolution during the transition from basic forms of communication to fully fledged languages. Basing his argument on the latest research in neuroscience, linguistics, and primatology, Michael Arbib presents an up-to-the-minute version of a theory that offers insights into the evolutionary importance of the brain's mirror neurons that enable monkeys, chimps, and humans to recognize the actions of others. Only in humans have these evolved to allow the "complex imitation" which supports the breakthrough to language. This theory, he shows, lights the path from the simple manual gesture we share with apes, to the imitation of manual skills and pantomime, and to the development of sign language and speech. It also explains why we can learn sign languages as easily as we can learn to speak. The author looks at how the brain mechanisms that made the original emergence of fully-fledged languages possible are still active in the ways that children acquire language today and sign languages continue to emerge. He also shows their crucial role in the processes by which languages change on time scales from decades to centuries. 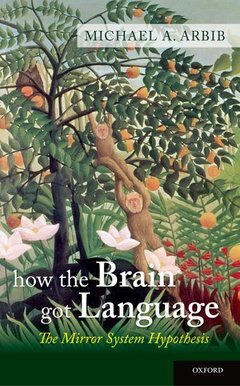 This book explains how the brain evolved to make language Michael Arbib provides nonspecialist readers with all the necessary background in primatology, neuroscience, and linguistics. His compelling account of this fascinating subject is fully accessible to a general audience. Part I. Setting the Stage. 1. Underneath the Lampposts. 2. Perspectives on Human Languages. 3. Vocalization and Gesture in Monkey and Ape. 4. Human Brain, Monkey Brain, and Praxis. 5. Mirror Neurons and Mirror Systems. Part II. Developing the Hypothesis. 6. Signposts: The Argument of the Book Revealed. 7. Simple and Complex Imitation. 8. Via Pantomime to Protosign. 9. Protosign and Protospeech: An Expanding Spiral. 10. How Languages Got Started. 11. How the Child Acquires Language. 12. How Languages Emerge. 13. How Languages Keep Changing. Michael Arbib was a pioneer in the interdisciplinary study of computers and brains, and has long studied brain mechanisms underlying the visual control of action. For more than a decade he has devoted much energy to understanding the relevance of this work, and especially of mirror neurons, to the evolution of the language-ready brain.